24 volt to 12 volt trailer lighting converter, input 24 volt 7 pin plug (24N) to output 12 volt 13 pin socket, maximum load of 60 watt per line. Allows a 12 volt trailer to be powered from a 24 volt tractor unit. 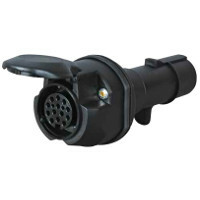 24 volt to 12 volt trailer lighting converter, input 24 volt 7 pin plug (24N) to output 12 volt 7 pin socket (12N), maximum load of 60 watt per line. Allows a 12 volt trailer to be powered from a 24v tractor unit.